This entry was posted in Comments about Cycling on July 19, 2016 by Steve Tilford. I was watching the finish of the Tour yesterday, which finished in Bern Switzerland, after a tricky cobble climb, then a drag race to the line. Afterward, I was glancing at the results and they placed 59 riders with the leaders time. I had watched the finish and knew the group was way smaller than that, so I went back and watched the finish again and there were somewhere around 30 guys sprinting. A couple got dropped right at the finish, but whatever the number, it wasn’t 59. I was wondering if there was a crash or something within the last 3 km where they would give everyone the same time. I didn’t remember seeing a crash, or hearing the commentators mention one either. So, I went back and watched the race from 5 km out. I didn’t see anyone fall in the in the end, just guys getting popped. My question, did they score the race somewhere out on the course and then let the leaders sprint for the placings? I know they do that on the final stage in Paris, but I’ve never heard about them doing that in other stages much. It seems like the guys in the groups behind were still riding hard to the line. If there was a place where the officials said they assigned times 3 km out or something, then everyone would have just rolled in. Let’s just use Ramunas Navardauskas (Lithuania) CANNONDALE-DRAPAC. He attacks in the final, maybe 2 km out, then blows. He is scored at the same time as the winner, when he rolls across the line 30 seconds back in the video below. Weird. It is sometimes strange what the officials at the Tour address, and what they don’t. I’ve noticed that on all the finish climbs, team support from Sky, etc. are standing in the crowds, clandestinely, then the step out and hand out “illegal feeds”. Then they disappear back into the spectators. It seems weird. They can get bottles from cars, at the feed zone, etc. I’m not sure why they need to break the rules to get some liquid so late in the race? How about Fabian Aru getting his sticky bottles a couple stages ago. He didn’t even take a bottle, then when he did, he held on, what seemed like forever, then tossed the bottle off without drinking out of it. Come on, it is towing. Getting back on, after a problem, is hard sometimes, but he could have been drafting his team car easier than holding on. 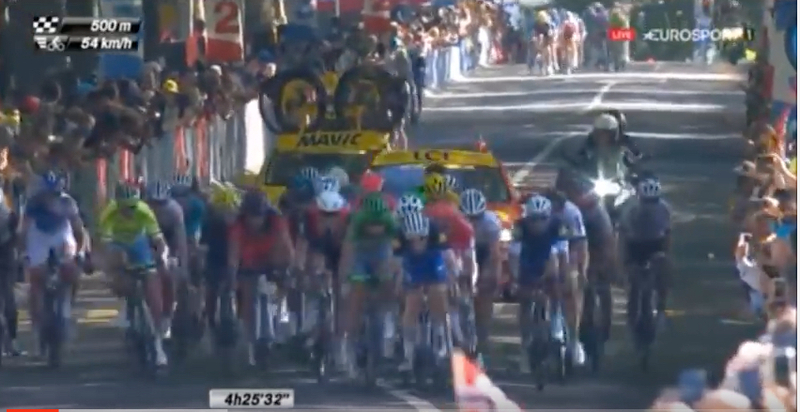 There is no way that there are enough officials at a Tour stage to police the whole race. Obviously, the riders don’t police themselves. I think the officials should use the TV footage, anytime they see fit, and levy penalties if guys are spotted breaking the rules. I know this isn’t the answer to all the problems, but at least it would make teams think twice before, pretty much, blatantly/pre-planning, breaking the rules. *** Okay, I had the official Tour results forwarded to me from Sean Weide and it seems that they did split the field correctly. It is weird that Velonews would post the results incorrectly for some reason. I wonder if they had some preliminary results and never got around changing them. I just looked this morning and they were still wrong. Now I checked and they changed them. I wonder if this had anything to do with that? Anyway, real results below, which seem all correct to me. Still doesn’t address the sticky bottle/sneaky bottle deals. The group around 30 seconds from the finish. This picture shows the gap to the next group. I had the exact same reaction. I knew there was no way 59 guys finished on the same time. 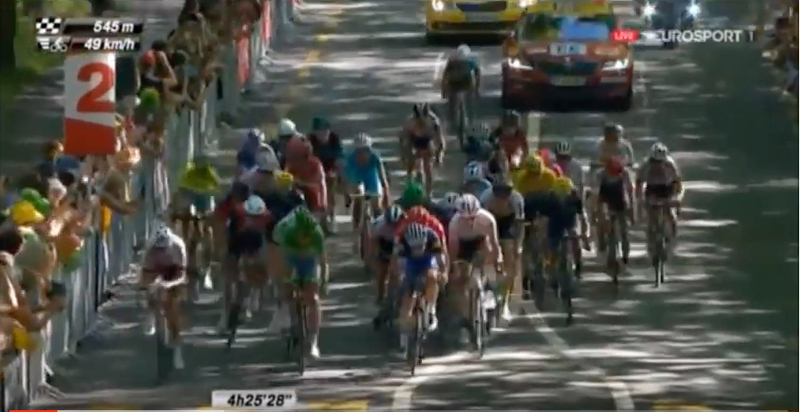 I figured the officials made a call at 1 KM to go or something, and didnt tell anyone. Perhaps because it was such a tight finishing circuit. Jens V. was okay with Aru drafting, getting a sticky bottle and a couple of rear brake adjustments. What did he say, Aru shouldn’t be penalized for getting a bike change and then having to chase, lol. I saw Ramunas Navardauskas come across the line WAY after the leaders finished In fact I “think” I remember P&P commenting on it. How, in the name of God, could he have been given the same finishing time. Makes you wonder where else they helped riders? Special liquids require special delivery. The officials do levy fines all day long for sticky bottles and other infractions. But the fines are pretty minor and the teams just pay them as if it’s part of the cost of doing business. 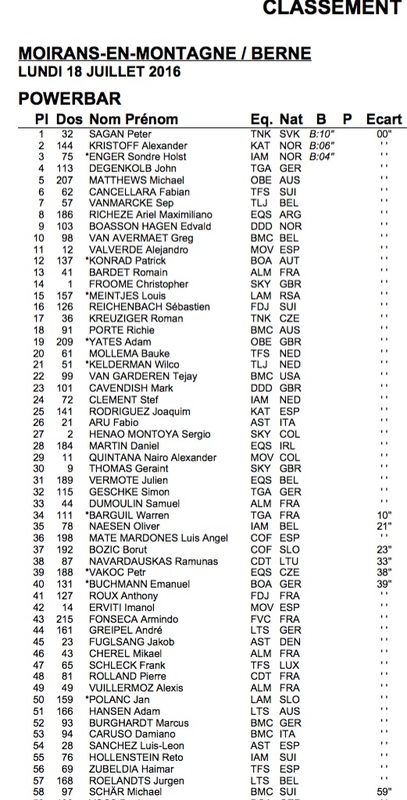 As you can see, only the first 33 riders to finish received the same time as the stage winner. Don’t trust cycling websites for race results. Go to the source. If the officials don’t take professional bike racing seriously, how is anyone else supposed to? To ignore application of the rules makes it into a spectacle (which probably generates more revenue) more than a sport. It’s pro wrestling. This thing you noticed isn’t something that the fan who is relatively new to cycling wearing his “Shut up legs!” shirt would pay attention to. Maybe that is the audience they are pandering to? Perhaps French culture results in a more poetic approach to the application of rules? Please ignore my ramble below! Since the time limit formula changes with the type of stage, me thinks that the officials are being lenient for the sake of keeping riders in the race. Lots of pressure from the teams (and sponsors) to allow their riders to stay in the race. Reminds me of watching the 89 Tour prologue when Delgado was late to his start or in the first TT. I remember seeing him take a weird little hand-up in a little plastic bottle, chug it and chuck it. I remember the commentator referring to it as a “mystery elixir”. Doubt that will matter for the GC or Green. How about some positive vibes. I mean after the RNC last night its all coming to an end!!!! Haha! Maybe the UCI should adopt that kind of messaging. YOUR FREEDOM TO RIDE A BIKE IS COMING TO AN END!!!! They are coming to take your bikes away!! AAAAAAAAAAAAAAAAAAHHHHHHHHH!!! Let’s not start a conspiracy theory…the world is full of people outside the know. I was at the Tour Prologue that year and witnessed that whole incident. I had just parked my car on a back street and here comes Pedro down the street, lost. Being American (of Spanish decent) we had a conversation regarding him losing his way. What you see on the link regarding the hand-up was no magic elixir…..unless you believe in aliens or any of the national news broadcasts we have today. When are we going to educate ourselves with facts and not always jump to conclusions? Life is too short and precious for us to always think about aliens, Bigfoot, and Nessie. Absolutely… If there’s one thing certain, Pedro Delgado is above reproach. Oh wait. Nevermind. Delgado won the 1988 Tour de France by a comfortable margin. 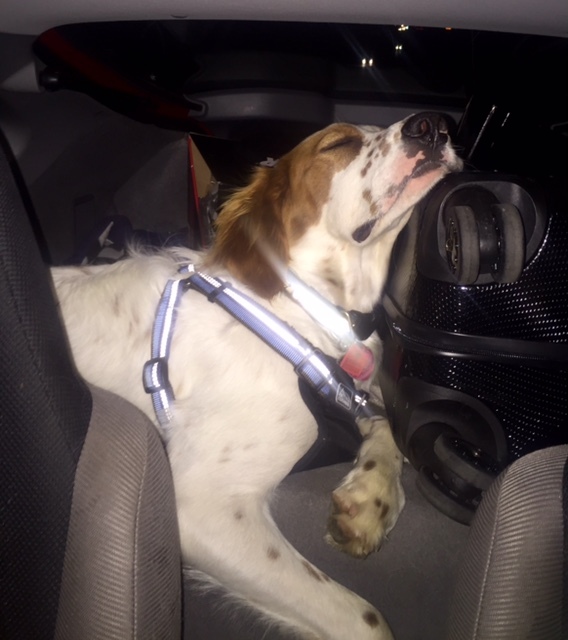 But the Tour was never easy for him. The evening after the 17th stage, the television channel “Antenne2” spread the news that Delgado had tested positive in a doping test. His team director José Miguel Echevarri was informed hours after by the Tour organization without mention of the substance. That night, Xavier Louy, director of the race, went to the hotel where Echavarri was and suggested to him that Delgado should withdraw. This was similar to the “Merckx affaire” in the 1969 Giro. The following morning Echevarri received the official communication. The substance was probenecid, a medicine for the kidney and also a masking agent for anabolic steroids. In 1988, every sport had a different list of banned substances and the IOC had its own, although there was a commitment to unify the lists in 1990. Probenecid was in the IOC list, but not in the UCI list (it would be one month later!) and rule number 35 of the 1988 Tour regulations stated that the doping test would be carried out in accordance with the UCI rules. The mistake of the laboratory seemed evident and the technical jury declared that Delgado had not broken any (UCI) rule. In 1988 the sanction for this type of doping was a penalty of 10 minutes, which was applied to Gert-Jan Theunisse during the same 1988 Tour de France; Delgado, having been cleared, received no such penalty. Delgado’s final advantage over the second rider in the overall classification, Steven Rooks, was 7:13 minutes. Third, 9:58 behind, was Fabio Parra. Delgado wore the “maillot jaune” for eleven days, and passed doping tests every day. There was no trace of probenecid nor steroids in any other test. He affirmed that he would always be grateful for the support received from the French public during those days. Xavier Louy was replaced as Tour director months later.